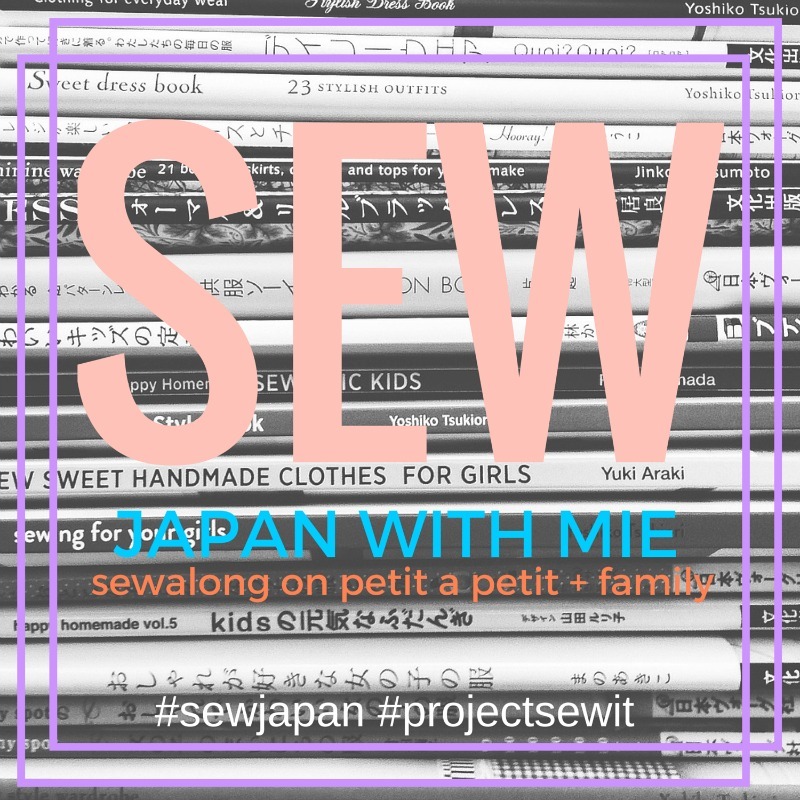 Today I got another school clothes inspiration post for you as a warm up for Sewing for Kindergarten that starts next week. This little lady has one last year of preschool before Kindergarten waits next year. The pattern is self drafted ages ago and I have made SO many dresses from this basic pattern. 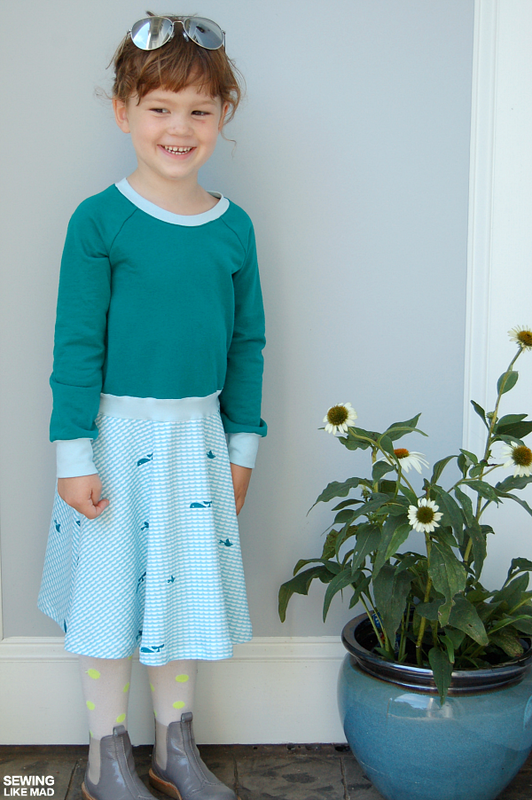 A raglan tee or sweatshirt pattern with a sort of half circle skirt pattern and sometimes I attach a rib waistband. 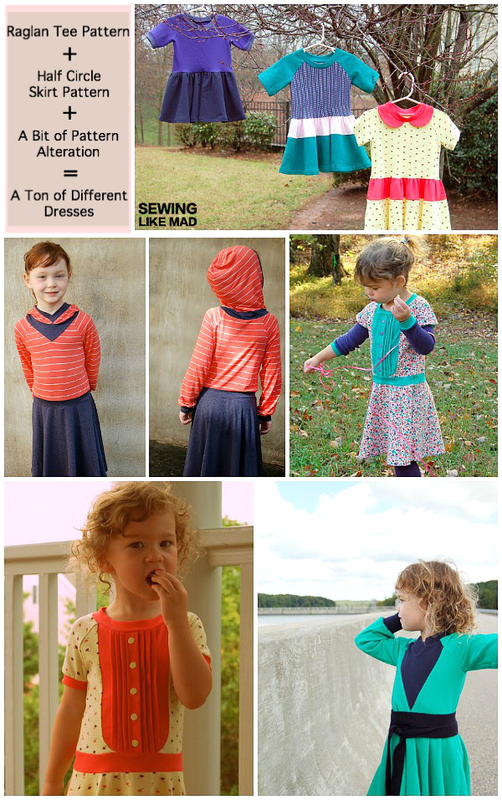 Below is a collages with of some of the dresses I have made from this pattern and blogged about. The teal/green fabric is a cotton sweatshirt fleece from Fabric.com bought ages ago. I have also used it for one of the dresses from the collage (top photo, middle dress). 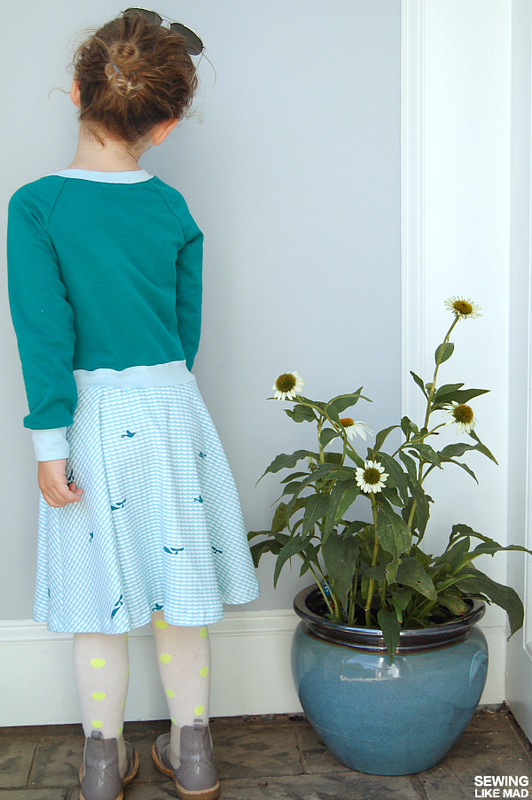 I paired it with a baby blue knit and this ultra cute printed organic cotton interlock from this new (to me) web shop l'oiseau fabrics. They are based in Canada and specializes in European fabrics. I discovered them in THIS amazing post....and I totally got some of that amazing star fabric too. Poplin and knit both in charcoal grey with white stars. Woohoo. From the back - yeah, it's pretty straightforward. 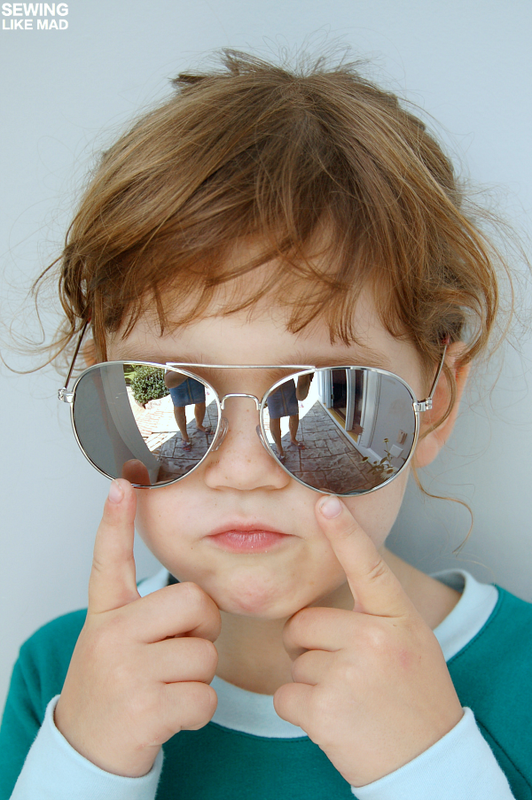 And lastly an alternative way to take selfies.....put mirrored sunglasses on your child! Great dress! It looks so comfy. 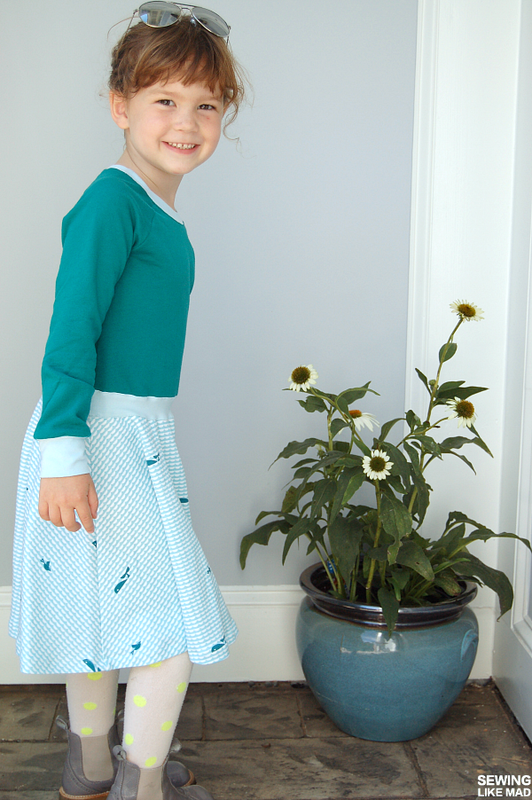 And the skirt's fabric is adorable. 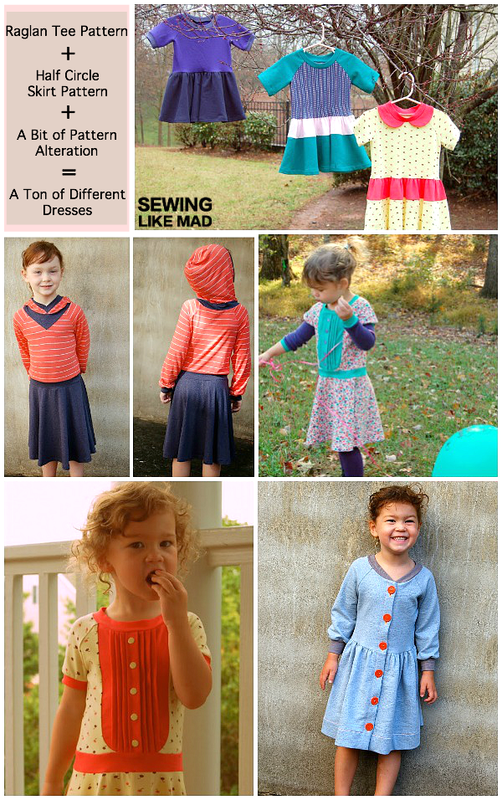 I have to start sewing knit dresses for my girls so thank you so much for the inspiration! Those colors... those colors!... 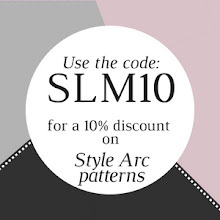 I am in love... And you should (you really should) sell this pattern in all its variations - it is perfect! so cute! i love the mash up of patterns and the adorable result! !